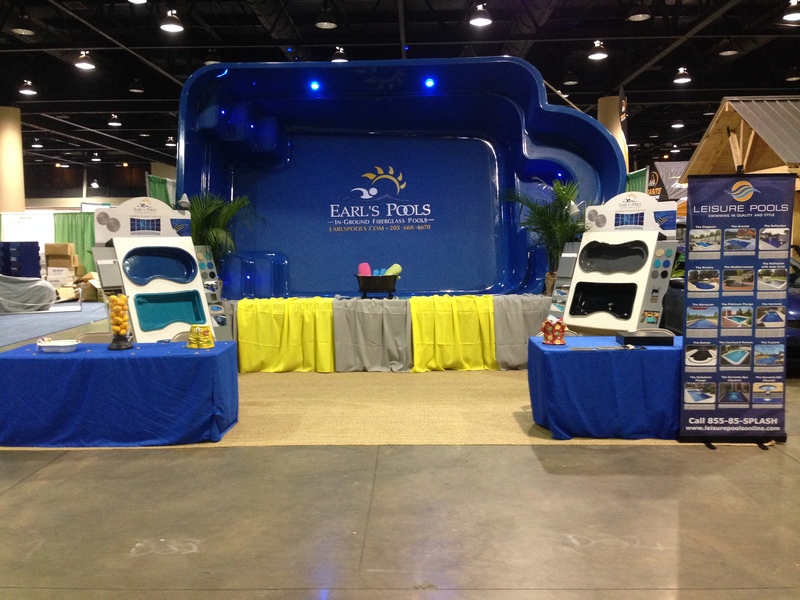 Earl's Pools will once again be at the Birmingham Home and Garden Show. If you're looking to install a pool now or in the early stages of considering a swimming pool, please come by and visit our booth to get educated on fiberglass pool cutting edge technology, pricing, or the process of the installation. Pool Quality - How is it measured for consumers? ICC What is it andwhv should I care? Part One : What is it? claim to fame and frankly it can be overwhelming sometimes to sort the fact from the fiction. you should ask for! What is this,you may ask???? lt is your manufacturer's ICC approval certificate! We have put our product to the highest possible endurance tests and passed! would be extremely difficult to pass but persistence has paid off' says Gill. IGG What is it andwhvshouldI care? Part Two : What Does lt Mean To Me? pools passed speaks volumes about the quality and integrity of Leisure Pools. same way to ensure that we are always meeting the guidelines expected by us. this is mandatory, how do you know that it is being built the same way? Anytime is a good time to install a fiberglass pool, but with temperatures not very warm and wet conditions in the winter months the installation of certain pools can be challenging. Cold weather is not a good time to hang a liner in a vinyl liner installed pool. Cold and wet weather is not a great time to install a concrete pool because of the curring process and the time it takes. Anytime is a good time to install a fiberglass pool, due to the elements of weather not delaying or changing the installation process. 1. Installers are generally not as busy and can have more personal time with the buyer. 2. 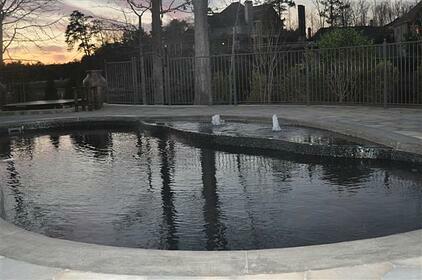 The buyers have time to have their yard ready by the spring to start enjoying their newly installed fiberglass pool. 3. Buyers have more time to think about extra projects such as water features, outdoor kitchens, and fire pits. 9 Reasons: Why I Should Install a Fiberglass Pool. 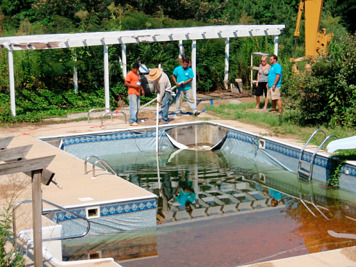 Many of our sales are to homeowners who are installing a new pool for the second or third time. They have owned gunite and vinyl pools before and know all too well all of the problems. ‘We just want a fiberglass pool, it makes so much sense’ is a common statement we hear all the time. So why is a fiberglass pool the smart option? 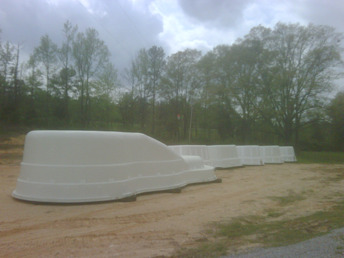 Your fiberglass swimming pool comes direct from the manufacturing facility, pre-made and ready to install. In fact, you can be swimming in as little as four days. Compare that to a concrete pool that can take months to complete and during that time your backyard looks a mess. 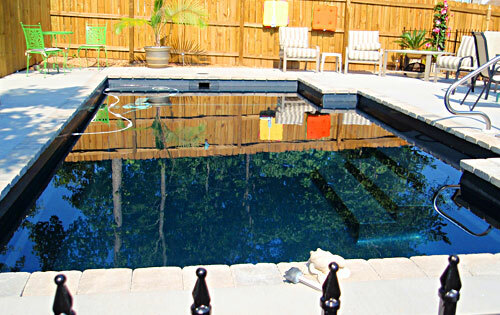 Fiberglass swimming pools have a smooth clean gel coat finish that is non-abrasive. There are no sharp edges or rough finishes. Compare that to some pebble pools that are so abrasive they can harm your skin. The high tensile strength of fiberglass will allow the pool shell to flex without cracking to accommodate earth movement. No wonder airplane manufacturers are using fiberglass to build planes! The gel coat finish on a fiberglass pool not only looks great, it's so easy to look after. The surface is smooth and non-porous so it cleans easily and is very stain resistant. No one likes swimming in a chemical cocktail but some pools require constant monitoring and expensive chemicals. Not so with fiberglass. The surface is chemically inert so there is absolutely nothing in the pool surface that can alter the water chemistry. Hence, very low chemical usage and considerable cost savings on running your pool. Sometimes what we see in our minds doesn't always translate to the pool builder. With fiberglass, what you see is what you get. The swimming pool styles and sizes come off molds and cannot vary in any way. Salt chlorinators, chlorine, fresh water systems, ozone systems all work wonderfully well with fiberglass swimming pools. Whatever your choice may be, it will be compatible. Leisure Pools fiberglass pools from Earl’s come with a 35 year structural warranty. At best with a concrete swimming pool you will get a 10 year warranty – do you hope to have your pool last longer than 10 years? Consider also that Leisure Pools USA offers a 15 year surface warranty and exclusive Aquaguard® gel coat finishes. Most other fiberglass manufacturers can only offer a 1 year warranty or no warranty at all. The most common myth surrounding fiberglass pools and propagated by competitors in gunite pools or vinyl liner pools is that "Fiberglass pools pop or float out of the ground." When you are told this you should immediately ask just how a pool with 80 tons of water in it pops out of the ground. The reality is that no more will gunite or vinyl liner pools pop or float than will fiberglass pools. In fact any watertight object will float if there is more water under it than in it. Pools can only float when they are drained and the water under the pool exerts upward pressure because there is no water in the pool. So why would you need to drain a pool? 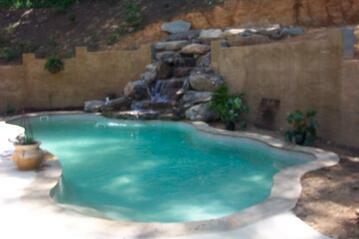 Gunite pools need frequent draining to remove cracks, acid wash, clean stains and re-plaster the pool. Similarly, vinyl liner pools must be drained to replace liners or repair liners. Fiberglass pools carry a lifetime warranty and never need resurfacing so there is no need to drain the pool. 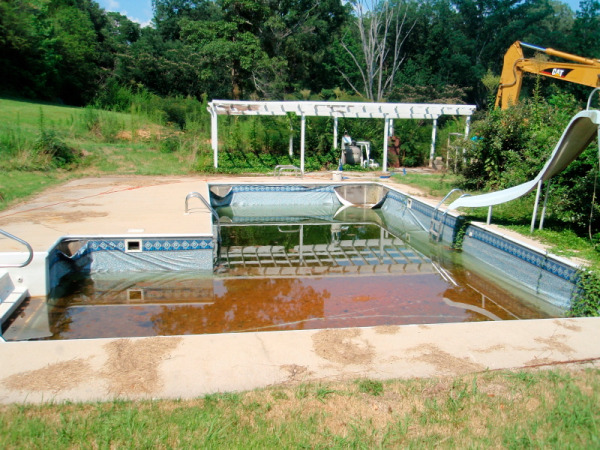 So the end result is that many more gunite and vinyl pools float than do fiberglass; don't be fooled. Anyone concerned with water under the pool should consult their pool dealer and have a simple drain installed so that water under the pool can be monitored and drained if necessary. There is a wide selection of solutions so there should never be any damage to any pool as a result of high water levels under the pool. What type of equipment works best when excavating a fiberglass pool? We here at Earl's Pools of Alabama have used many different types of equipment throughout the years when excavating a hole for installing a swimming pool. 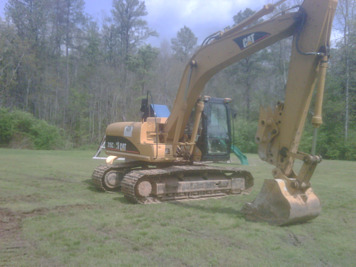 We use a trackhoe excavator to install our pools in our installation department for a few different reasons. This excavator is on a track system, which allows us the oportunity to work in areas that a tractor with tires wouldn't. The 360 degrees of motion with the cab of the excavator allows you to sit in one area and dig as well as load a dump truck with ease. This speeds up the excavation of a swimming pool hole dramatically. The weight of the machine we use is about 33,000 pounds and can be used to compact fill dirt outside of the pool area by walking it in. The legnth of the arm on the tractor that we use is long enough to pick up all of the fiberglass pools that we carry, so we use the excavator to actually set the pool in the hole once the hole has been dug and gravel placed in it. Contractors across the nation use several different types of equipment to accomplish the installation of swimming pools, but a trackhoe excavator works best for us. Can you install a fiberglass pool inside an existing pool? Would you like to have this situation in your backyard? Unfortunately one of my customers had this unpleasant site in her own backyard, and with the site of this she asked me if there was any hope. After assessing the situation, I let her know that my recommendation was to install a fiberglass pool inside of this nightmare that she currently had to deal with. We discussed a few things initially she needed to consider. What cost am I looking at for this type of project? - To install a fiberglass pool in this situation she basically was looking at a whole new install. Even though there was an existing hole there, the cost of additional gravel to fill in the area around the new pool would offset the cost of not having to excavate a new hole. Will you be able to tell there was another pool here before?- When we finish the job you will have no idea that there was anything here before. We actually set the grade of the new pool a bit higher and poured new concrete on top of the existing patio area that was there before. Do you think it is worth the investment?- One of the first questions that you must consider is if you intend on living there for a while or not. In her situation this is her retirement home and wanted to fix things up to enjoy for years to come. Even though the cost is high upfront to transform your backyard, by installing a fiberglass pool you save as you go. The chemical consumption on a fiberglass pool was cut down to about 15% of what she was spending with the liner pool she already had. Power usage also was cut to less than half of her existing pool, and the overall look that we created in her backyard for years of excitment and pleasure to come outweighed those years of frustration that she had dealt with before. Her new pool that we installed requires about 20 minutes a week maintenance, and that is the one thing that has meant the most to her. So in closing can you install a fiberglass pool inside of an existing pool, why yes you can. You must weigh out what is best for you and your family of course, but it is worth the investment down the road. Are fiberglass pools too slippery for comfort? This is starting to become a concern to some customers, because of the new age pools are not having the traditional hand rails or ladders being installed. This has really been the trend for Leisure pools and their higher end luxurious looks for a number of reasons. Now days people are not only having pools installed for swimming, but to enhance the pool area as a showpiece used for entertaining before swimming season and when it is over. Whether its a get together or just to sit out and relax, people tend to gather around something. This is where your back yard oasis comes into play with the endless options of landscaping, outdoor fire places or pits, outdoor furniture, lighting and water features, etc. Some tend to think ladders and handrails are an eyesore and takes away from the pool or just get in the way. Although in some applications they are necessary for some people, it should not be much of a concern getting in and out of these pools. Leisure makes a non-slip surface on all the pool and spa bottoms, seats and steps. This textured surface does not take away from the colors or sparkles and is barely visible when water is in the pool or spa, but does create secure standing areas on the bottom of the pool. If you may have any questions or concerns with the bottom texture of a fiberglass pool please feel free to contact me. 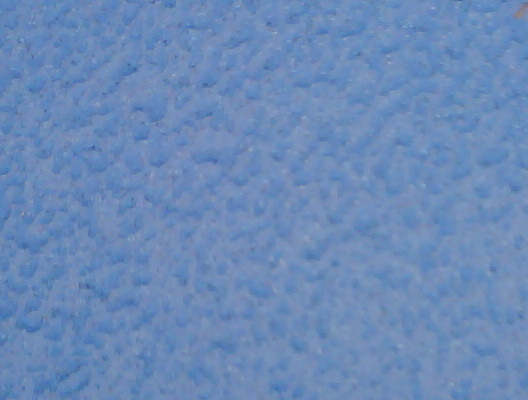 Here is a close up picture of the texture with no water on it. What size fiberglass pool is best for my family? One of the most common asked questions is, "How big of a pool do you think we need to accomodate my family?" This question is only answered by myself when talking with others after I have spent some time with them getting to know them and their family a little better, with understanding some of their hobbies and listening to what they intend to get by installing a pool in their backyard. Let's face it most installs now days are done to provide that backyard escape for families that allow them to stay at home as a place of vacation. Here are a few things to keep in mind when choosing which style and size pool are best suitable for you and your family. One thing to consider is the option if my family needs a diving board or not on the pool. If so, then in order to have a diving board installed on a pool it needs to meet a depth of eight feet or more. This can limit your choices to sometimes only a few different styles. If you are the type that loves to have company over and entertain others, then you may want to consider a gradual slope pool, due to the fact that if the pool only goes to six feet or so then most can utilize the entire pool. Depending on the size of the backyard you want to choose a pool that is small enough that you allow yourself to provide adequate patio spacing to enjoy furniture for lounging and entertainment around the pool as well as within the pool itself. If you have smaller children like I do then one of my concerns is finding a pool that provides a play area for little ones incorporated into the design that I choose. One of my favorite designs in this situation is the Riviera made by Leisure Pools USA due to the large seating area on the shallow end of the pool that is ideal for smaller children to enjoy. You may be one that requests some customization to a fiberglass pool, whether it be a tanning ledge, spillover spa, water features, or even a negative edge pool. If this is the case then with the availabilty of many shapes that are provided in today's market you open yourself up to many different options to incorporate that special look you desire around your investment with a pool. In closing, we here at Earl's Pools of Alabama look forward in assisting all of our customers in meeting their needs whatever they may lead to be when choosing which pool meets their needs the best. If you would like to receive more information about the fiberglass pools that we install here at Earl's Pools please fill out one of our contact forms, and we will get back with you as soon as possible.